Camphor (1.7%), Menthol (0.7%), Phenol (0.4%). Beeswax, Cetyl Ester, Flavor, Fragrance, Lanolin, Parafin, Salicyclic Acid, Theobroma Cacao (Cocoa) Seed Butter. Nice smell Works great A little sticky on the lips Winter is approaching here in Canada and the dry lips have already started. In addition to my skin getting dryer with the effects of BP, my lips have taken that hit too. 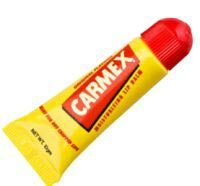 Carmex is medicated and smells like vanilla and menthol, which is an oddly lovely smell. It is non-comedogenic and I apply it liberally so it spills onto my skin, and hasn't caused breakouts.